Once a year a group of Greenwich artists open their studios to the rest of us for two weekends. 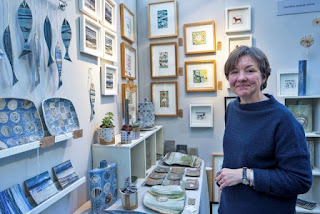 Caroline Nuttall-Smith of Ashburnham Grove, shown here with some of her ceramics and linocut prints. John Bangs in Blissett Street is the next nearest, showing pastel paintings and drawings. The other twelve are not far away, exhibiting a wide variety of art. 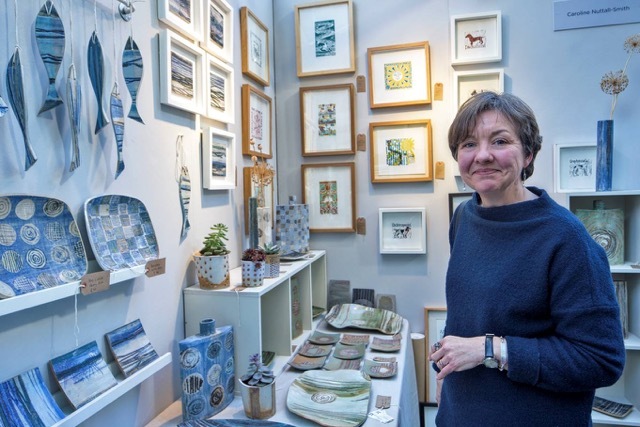 As well as ceramics, prints, and pastels, you will find collages, sculpture, drawing, jewellery, textiles, photographs, monotypes, and painting in acrylics, watercolours and oil. Opening times are 2pm to 6pm, unless an individual artist states otherwise. PS We were lucky enough to have Caroline running the spin painting at the street party last September.